Before you even begin to do any research, try to narrow down what you need, what you can afford, and what you can tolerate. Is it specific marketing advice? Are you confused about the direction of your practice? Do you need help with writing statements or proposals or bringing your website up to speed? 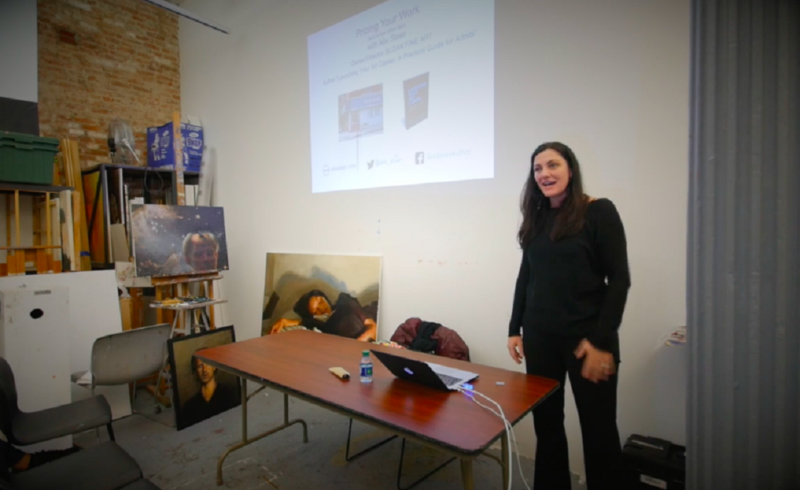 Does the gallery business leave you totally flummoxed? How much homework can you stand? Make a list, then look at what’s out there….and where you’ll get the most bang for the buck (and be aware that oftentimes courses are nonrefundable). And take advantage of any free webinars offered before signing on. As I mentioned in the previous post, I like to think that I cover some of this material for free (and by the good graces of your support as members)—topics like how to fix your website, work with dealers, negotiate a contract, cultivate your collectors, make the most of social media like Instagram, and so on. But I also concede that there are artists who benefit hugely from group participation, individual problem-solving sessions, worksheet assignments, and having their feet held to the fire on a regular basis. 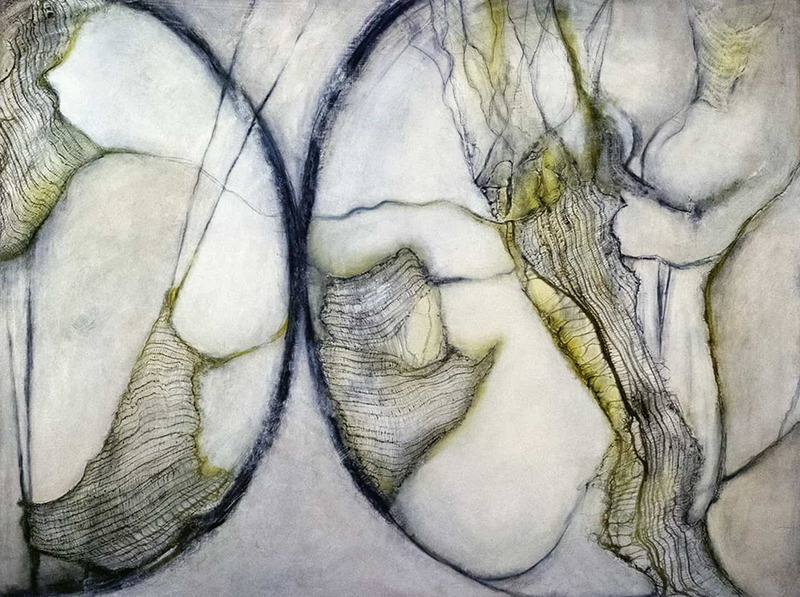 Lisa Pressman is an established artist who works in encaustic, oil and other media, and has a long track record of gallery shows, most recently at OTA in Santa Fe, NM. 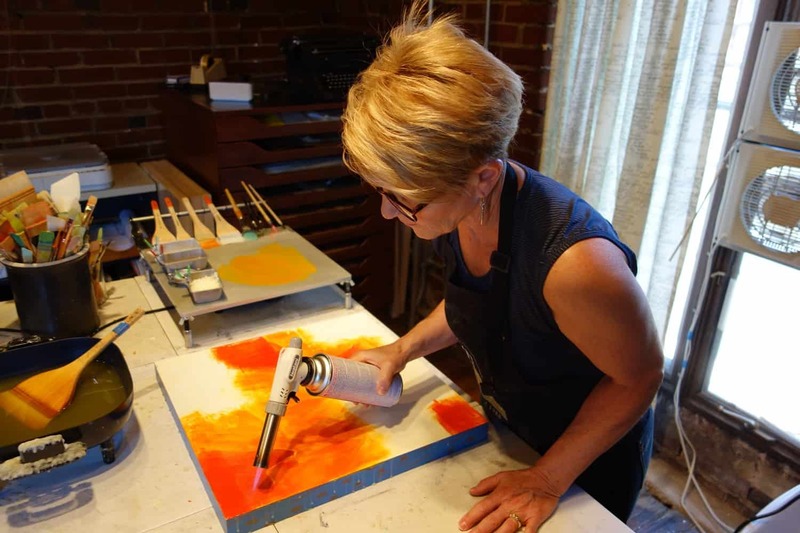 She also has many years of teaching experience, as an instructor for R&F Handmade Paints in Kingston, NY, and as a guest artist a number of colleges and universities, including: Pratt, Western Michigan University, and Portland School of Art. Many of her individual students come from workshops she’s given (where she earns high marks for her expertise and sense of humor). Pressman offers three-hour mentoring, one-on-one, generally in half-hour sessions, via Skype for $525. Many of her clients are looking for artistic, as opposed to marketing, guidance. “If it’s a beginner, I’ll talk about the fundamentals—values and composition and other basics of making art. 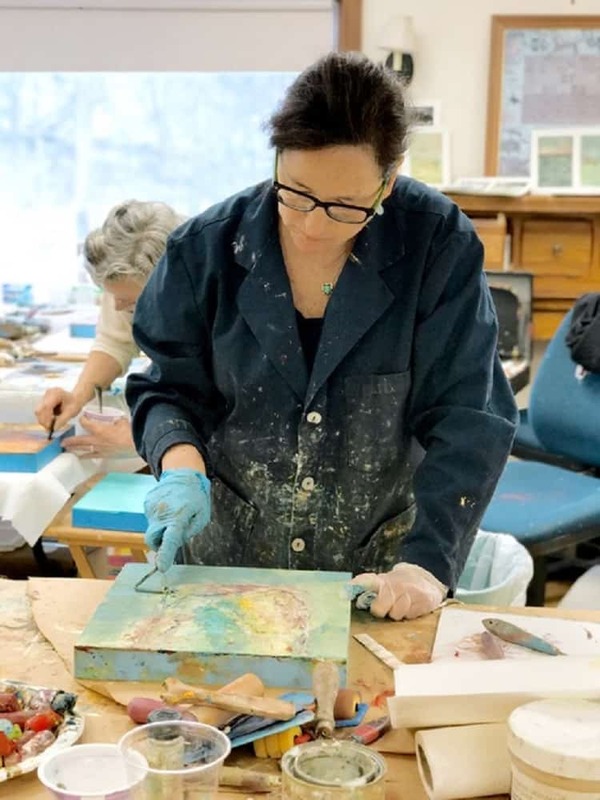 With someone more advanced, I’ll look at the body of work and ask, Where do you want to go with this?” Many of her students have been out of the loop for a while and want to get back into regular studio work. Or they are isolated in small communities, without a network of friends and professionals to turn to for advice. And there are those who are feeling just plain blocked and look to Pressman to help work their way through the impasse. Through Facebook, she maintains a private group of students and reaches out to let people know when she’s available. As of this writing, she has about 25 artists she coaches on an ongoing basis. Julie Snidle: “I took four workshops with Lisa over the course of three or four years, beginning at a time when I wanted to take my studio practice to the next level, from a part-time hobby to getting more serious about having my name out there. Her advice ranged from how to improve a painting to how to improve the business side. “Lisa has a humorous but straightforward approach and asks thought-provoking questions. She’s a good listener who can put issues into language that’s accessible. We both work in the same medium, and though I’m older, her experience has been invaluable. She’s been down a lot of the same roads I’m going down myself. Lynn Luukinen: “Lisa had been a mentor of mine for several years. I first took a workshop with her several years ago when I was new to painting in cold wax. After spending 12 years in the textile world, I really needed some direction. “My most significant work with her was during this past year in preparation for a large gallery exhibition called ‘Heaven and Nature Sing.’ I did a layout of the gallery and figured out how many paintings I needed to do, and in what medium, and then I began to work through my thought processes as to what the title meant. How do you begin creating a body of work that’s brand new? She gave me ideas and exercises. Once I got going, she was able to evaluate my process and make suggestions, honing in on my strengths and ideas. It was incredibly valuable. I couldn’t have created that body of work without her. Erin Elder has a master’s degree in curatorial practice and a background in both traditional museum curating and in creating what she calls “platforms for artists.” Her website describes her interests as “land use, experimental collaboration, and non-traditional modes of expression.” She was in charge of an off-the-grid residency from 2009 to 2014 and worked as the curator at the Center for Contemporary Art in Santa Fe, NM, for three and half years, where she organized more than 50 exhibitions. Elder now devotes the bulk of her time to about 70 private clients, using her background in curating to help artists realize their projects. 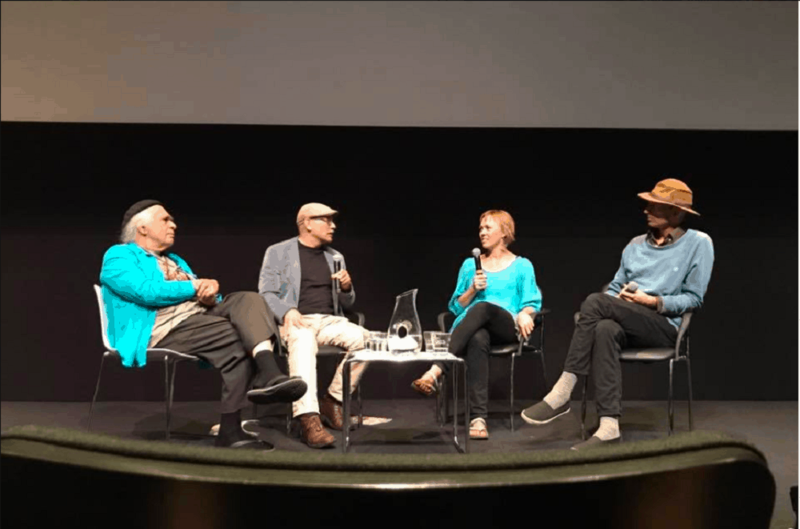 “When I was at CCA, we were working with artists to create exhibitions specifically for that space. So I ask a lot of the same questions of people that I did then: What do you want to do and how can I help you get there? “Clients come for a variety of reasons,” she adds. “Some are fresh out of grad school and others have 40 years’ experience. There are artists who want to find out about opportunities: Where can they find an audience, where can they get support? I might help them put together a proposal or offer advice about different grants. It’s very customized and one-and-one, and I work with all clients confidentially. Anonymous Painter: “Most of my projects with Erin have had to do with grant proposals and time management. Our efforts have been collaborative and project based. As artists, we often have to be the producer, the marketer, the public relations person, and it helps to have some support. “A coach who knows how to write and edit is very precious, and when we work on proposals together she can cut my time in half. She helps with formulating ideas in the ways that individual granting agencies require, and with her background as a curator, she’s attuned to what juries are looking for because she has the institutional knowledge. When deadlines come up, I can delegate tasks to her. Andrew Fearnside: “I work as a therapist part time, and I’ve done a lot of therapy in my life. As a practitioner of therapeutic conversations, I understand that everything changes and everything evolves,” says Fearnside. 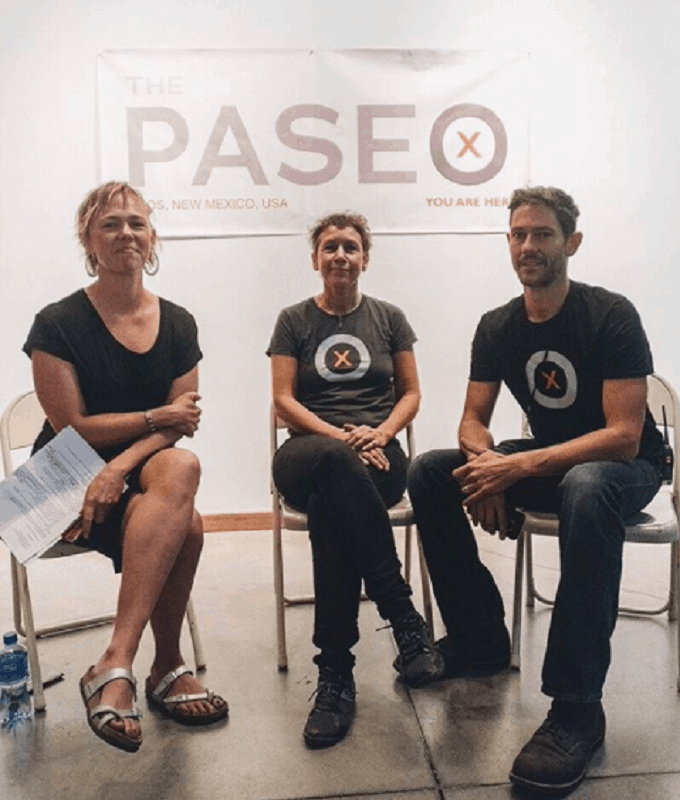 A few years back, after hearing Elder give a talk about writing a grant proposal at 516 Arts in Albuquerque, NM, he was impressed enough to realize he wanted to have a partner in creating goals and taking actions—”re-assessing changing ideas, while using coaching conversations. It’s one of my tools for staying grounded, as I’m somebody who thinks that the creative process has many dimensions. “As an emerging artist, I was trying lots of different forums,” he adds, “and I needed someone who could help with a lot of directions at one time. My goal has been to move from emerging to someone who is having a career. “We both live in Albuquerque, so I would meet with her in my studio. I would write myself a paper in prep for conversations about where I thought I was, where I thought I wanted to go, and what kind of action I had taken toward the goal. Before opening a gallery on the Lower East Side in Manhattan in 2008, Alix Sloan was director of a gallery in Los Angeles, and worked in television and film production and as an advertising copywriter. When she gave up the brick-and-mortar space in Manhattan, Sloan put together a program “designed for emerging to mid-career artists who have specific questions, concerns or issues and/or are just feeling a bit stuck or lost as to next steps,” according to her website. Her private clientele is small by comparison with others. “I probably do about three or four consultations a month, then there are three or four I coach on a regular basis. And then there are six to eight people I work with to strategize toward specific goals. I also have a few with whom I do ‘tune-ups’ once a year. 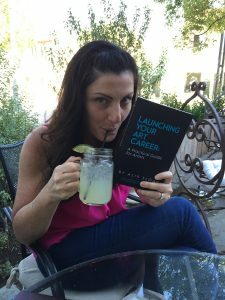 She’s written a book called Launching an Art Career: A Guide for Artists, updated a year ago and available as both an e-book and a paperback for $9 or $12. “I tell everybody who contacts me to please read the book because a lot of artists can probably get what they need from that.” Now largely based in Los Angeles, Sloan still curates two or three shows a year and participates in the occasional art fair. Anonymous Painter: “Alix dives deep into an artist’s experience, beginning with her very detailed and comprehensive consultation prep form. So before we ever talked, the seeds were sown for an illuminating and productive dialogue. I appreciated the psychological depth she goes into. 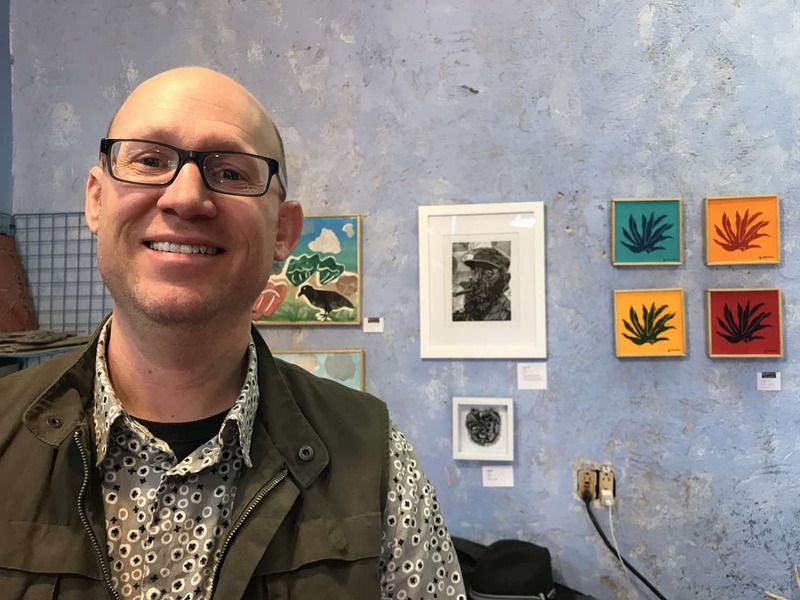 “Having already achieved some success as a working, self-taught emerging artist, I was looking for an objective perspective about next choices. Over a six-year period, Zitterman says he’s had two phone consultations followed by once-a-month “checkups.” Hers, he says, “is not a cookie-cutter approach. Everything is tailored to the kind of artist you are and the kind of market you’re in. Anytime we have a question or an idea, we would email and get a response from her. SO very useful! Thanks so much. This information is truly helpful as it shows the isolated artist another avenue. Currently I am working with Lisa Pressman after taking workshops from her which ignited technical possibilities with various materials. With this guided one on one work she encourages me to delve not only into where I am going with my work but to consider presentation through website, wording and social media for full outward appearance. Really great art coaching here, would love to see more.